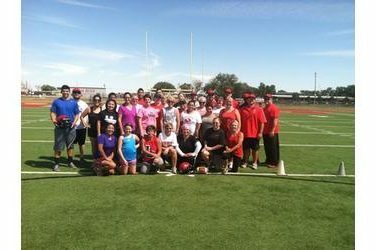 August 16th at 10 a.m. Twenty-two women from the Redskins family showed up eager to work and have fun at the LHS weight room for the first Moms Football 101 Clinic. The day consisted with a strength and conditioning introduction in the weight room, followed by a look at offensive positions and responsibilities in the classroom, and a short quiz. Afterwards the group headed out to the football field to take a crash course in heads up tackling, progressing from a defensive stance to a full tackle. Lastly the group and a few of the players met at Billy’s for lunch and conversation.